Matt Baldassarri grew up on the North Shore and attended Emerson College in Boston before moving to Washington, D.C. and beginning his popular national radio show, “The Night Prowl,” on XM Satellite Radio’s 50s on 5. Kelly Romanski grew up in Monterey, California and after graduating from the University of Nebraska-Lincoln, moved right back to Monterey and became a concierge at Pebble Beach Resorts. But she always wanted to check out the east coast and took a job working for her Member of Congress from California. Matt and Kelly met in in 2005 after Kelly requested a song and became a featurette on Matt’s show during her move from Monterey to Washington. Matt the Cat and Cross Country Kelly got married in Big Sur, California in 2008. Always wanting to return to the North Shore, Matt and Kelly, along with their two extraordinary inn-cats, Youkie and Petey, bought and renovated The Stepping Stone Inn in Salem, Massachusetts. 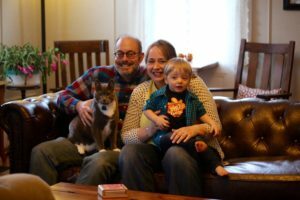 They are loving the innkeeper lifestyle, and Matt the Cat is still doing radio, recording his show, “Juke in the Back,” from the third floor of the Inn. Bobby was born during the crazy month of October in 2016, six weeks before his due date. It’s as if Bobby didn’t want to miss an October in Salem. He’s been livin’ the dream ever since. Matt and Kelly would love to have you stay at The Stepping Stone Inn and explore beautiful, historic Salem. You never know who you might meet or what you might see. Or what you might hear, in fact. The Stepping Stone Inn has been known to host an impromptu jam session now and then in the parlor! Post by The Stepping Stone Inn.